The first of the finals in this year’s Clare Champion-sponsored Cumann na mBunscoil an Chláir primary schools hurling and camogie championships were played at Cusack Park on Wednesday afternoon. Smith O’Brien’s 5-10 Feakle-Killanena 2-6In a very entertaining U-14B hurling championship final at Cusack Park on Saturday evening, Smith O’Brien’s caused an upset when they overcame the challenge of favourites Feakle-Killanena. 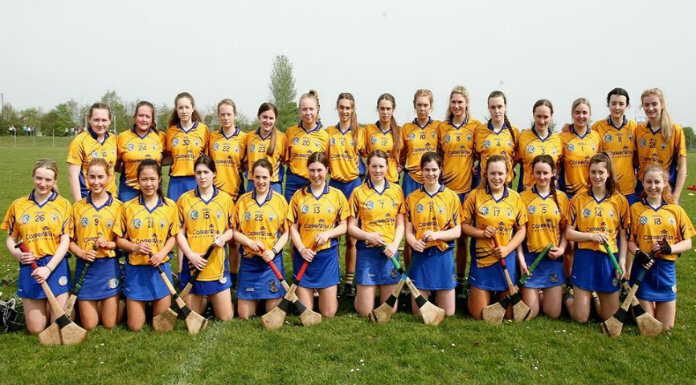 Clare’s senior camogie side will travel to Dublin to face the girls from the capital in first round of the Senior All-Ireland Championship this Saturday. The game will be played at the Naomh Perigrine Grounds in Blakestown at 2.30pm. Miltown Malbay man Christy Killeen is the new chairman of the Munster colleges GAA body. A long time resident in North Kerry, he is a member of the teaching staff at Tarbert Community College. Republic of Ireland international Shane Long was in Tulla this week and he took time out to meet with members of the local Tulla FC. ENNIS kickboxer Seamus Geoghegan will be defending the pride of both his county and country this weekend when he takes on Scottish middleweight Ryan Kyle as part of a full-contact international fight night in Wexford. THE Munster juvenile U-9, U-10, U-11 boys’ 2 x 2 team events plus girls’ and boys’ U-14 and U-15 Track and Field Championships were held in Castleisland and Clare athletes captured three gold, six silver and three bronze medals and a new Munster record set by Rachel Clancy (St John’s) in the high jump with a leap of 1.55m, Stacy Wright (Marian) won gold in the hammer while in the boys’ U-11s 2 x 2 team, the 600m gold went to Kilmurry-Ibrickane/North Clare with Caoilfhionn O’Dea and Cian Shannon the big winners. The Golden Vale Milk Clare Community Games variety competition was held in Sixmilebridge GAA hall last week.